The legendary Golden Gate Bridge, when completed in 1937, was the longest suspension bridge in the world. Spanning 8,891 feet, this infamous landmark, with its elegant Art Deco design, cost $35 million depression-era dollars. This panoramic photograph, taken from the top of the Marin Headlands captures the magnitude of the Golden Gate on a rare, fogless night. 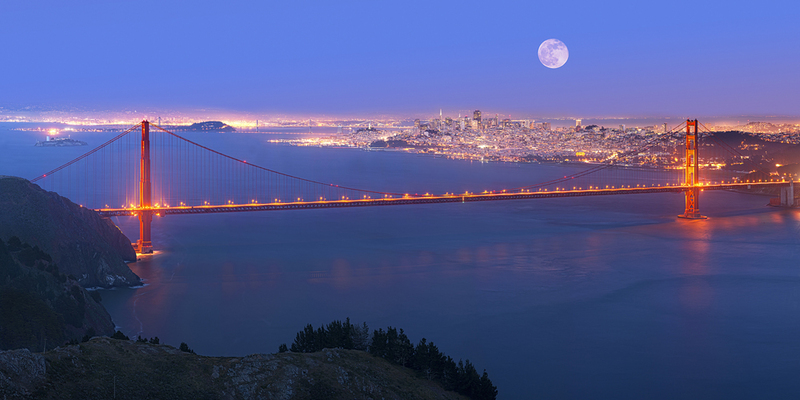 It took 48 exposures to record this amazing shot of the magnificent San Francisco Bay guardian under a rare "supermoon" rise, a annual orbit of the moon where it passes closer to the earth than usual which makes the moon appear approximately 14% larger and 30% brighter. May 9th, 2012: Are you Super Moon'ed out yet? I know I am...not just because of all the hype, but because I lived it the last three days, and nights. As cliche as it seemed, I didn't have enough time to get out of town to some exotic and unique location so I decided to punt and head to San Francisco, by backyard, to shoot the super moon. Yes, a full moon that appeared 14% larger and 30% brighter, to the eye. If you check out the news on this, there were many conflicting facts, but no doubt, it's a full moon and the forecast in San Fran is suppose to be clear, so off I went. I went up Friday night, 24 hours before the super moon. I went up to find a good spot to shoot from and to witness where the moon would rise over the city. My iPhone gave me a rough idea, and while it was close, I wanted to know exactly, for myself, with my own eyes. And I did. I took some practice shots and left that night with a plan on exactly what I wanted to do the next night. See, the plan was to shoot a multi-row panoramic. In fact, this image is just that. it's 12 images across, 5 rows high and then cropped to a 2/1 aspect ratio...back to the story. Saturday morning...I spent the first half of the day in the city, then arrived at my pre-determined shooting location at 1pm to secure my spot. i waited, and waited. I checked my email...54 times. I watched about 15 cars pull into the handicap parking next to me and only ONE of them seemed legit...but I digress. Then, at 8pm, just as the sun set, I jumped out and setup my gear. Showtime. 10 minutes into the blue hour...the city lights are not quite on yet, oh but we're close! Next thing I know "...The park is now closed...return to your vehicle immediately or you will be ticketed and towed..." WT-F?! Sure enough, the NSP rangers are CLOSING the road above the Marin Headlands. I held out as long as I could, hoping I could get through the 60 shots it would take to capture the scene...no dice. So, with the full moon a bust, I decided to return Sunday night for yet another attempt. I had learned from all the practice shots that multi-row panos at sunset is much more difficult that you might think! I learned that I had to shoot bottom up...darkest to lightest, in order to get even exposures for stitching later. I found a nice balance at f/13, 13 seconds at ISO 400 and white balance at 4200 kelvin. Allowed me to capture the blue of "blue hour" yet keep the reds of the bridge and lights in balance. But make no mistake, I had to hurry, there was ZERO room for a mistake. The great news is on Sunday, one day after the Super Moon, the rangers did not kick anyone out (until later) and I was able to get through all 60 shots, including the moon, and tonight it finally finished stitching. I made a few tweaks to brightness/contrast and cropped a tad. The clarity of Sunday nights sky was actually better than the night of the full moon, plus with the moon rising about 30-35 minutes later it allowed me to get a more "blue hour" shot. The detail in the original 300dpi version is pretty nice (sorry I can't post it full size). I shot it with a Canon 1Ds Mark III using a Canon 300mm lens. I used a Really right stuff tripod and multi-row nodal bar pano gear and a Canon cable release coord. I used the "silent mode" on the 1Ds Mark III to help reduce mirror slap vibration and constantly refocused each shot to help ensure maximum clarity and depth of field.